Did you ever think 7-Eleven beauty would be a thing? In November 2017, 7-Eleven introduced their own line of beauty products called Simply Me Beauty. The convenience store, known for Slurpees and Big Gulps, introduced a new line of stylishly packaged cosmetics all under $5. You can pick up some lipstick or eyeshadow along with those taquitos or Cheetos. While the affordable price has makeup junkies' wallets rejoicing, the products themselves have beauty gurus doing anything but. Their trials prove that while some of the products aren't half-bad, most of them are simply... not great. The new convenience cosmetic brand may not be good enough to replace your favorite splurge-worthy makeup, but at the very least, they will do in a pinch and have given us these hilarious videos of how beauty gurus react to 7-Eleven's new beauty line. 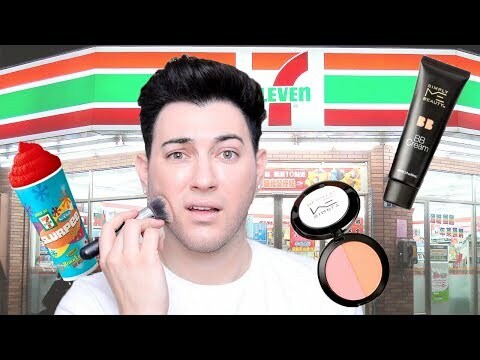 Manny Mua: "Collectively, 7-Eleven Makeup Was A Flop." The only "redeemable" item on 7-Eleven's makeup list was their lipstick, which Manny found "comfortable" and available in some pretty shades. Manny deemed the mascara "OK" and the BB cream entirely too shiny. The bronzer was a strong "f*ck no." Aside from the decent lipstick and tolerable mascara, everything else flopped like "a flaccid d*ck," and wasn't really enjoyable to apply. Princess Bellaa: "7-Eleven, You Need To Remain In Food." Princess Bellaa doesn't sugar coat it: 7-Eleven makeup is a complete disaster. She finds that their deepest shade of BB cream isn't deep at all, and their translucent powder is in fact not for "all shades" as it advertises. The collection completely fails to include options for women with darker complexions, and the products they do sell have poor coverage and dull textures. Out of the whole line, only the eyeshadow went on better than expected. Tati: "Is This My Favorite Look Ever? No Absolutely Not." 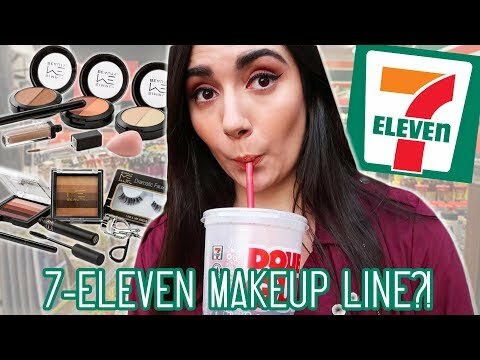 Tati went ahead and tried everything 7-Eleven had to offer, giving viewers a pretty wide look into the collection. The highlighter, brow wax, lip wear, and eyeshadow were hits in her book, but everything else ranged from "horrible" to "not terrible," and she suggests you spend your money elsewhere. She noted that the cosmetic line might have more potential when mixed with products she already uses and loves, but is a little dull on its own. Also, Tati says the lip crayons smell like crayola crayons, so there's that. Safiya Nygaard: "I Do Look A Little Bit Like An Academy Award." 7-Eleven is about the shine in their products, and not really in the attractive way. Nygaard found the creams too shiny, and the highlighter only added to the oily look. The bronzer and blush blended in pretty well, and overall everything was deemed "useable." After 5 hours and a Big Gulp later, she did need to reapply some powder and lipstick, so the line is by no means long-lasting. However, when you're ready to take it all off, she says the makeup wipes get the job done.